My wife and I cycled regularly before children, and now that we’ve had a daughter, we want to continue cycling as a family. 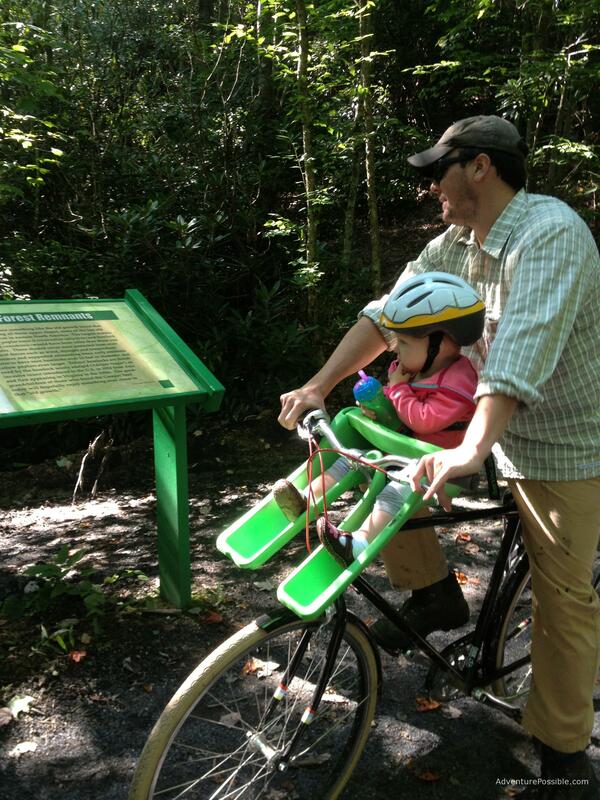 The Virginia Creeper Trail is an easy cycling trip for the family, even a family with a baby. The Virginia Creeper Trail is a 35-mile rail trail in southwest Virginia. The multi-purpose recreation trail winds through the mountains from White Top Mountain near the North Carolina border to Abingdon, Virginia. The trail permits hiking, cycling, and horseback riding, though most users bike the Virginia Creeper. The path is packed gravel and relatively smooth, and if you start at White Mountain Top and bike towards Damascus, the trail is mostly down hill for the 17 mile ride. Our Virginia Creeper bike ride begins in Damascus. My wife, 18-month old daughter and I had 9:00am reservations on a van shuttle to carry us and our bikes 17 miles out of town to the top of White Top Mountain. We brought our own bikes, though there are likely thousands of bikes to rent from half a dozen outfitters in Damascus. 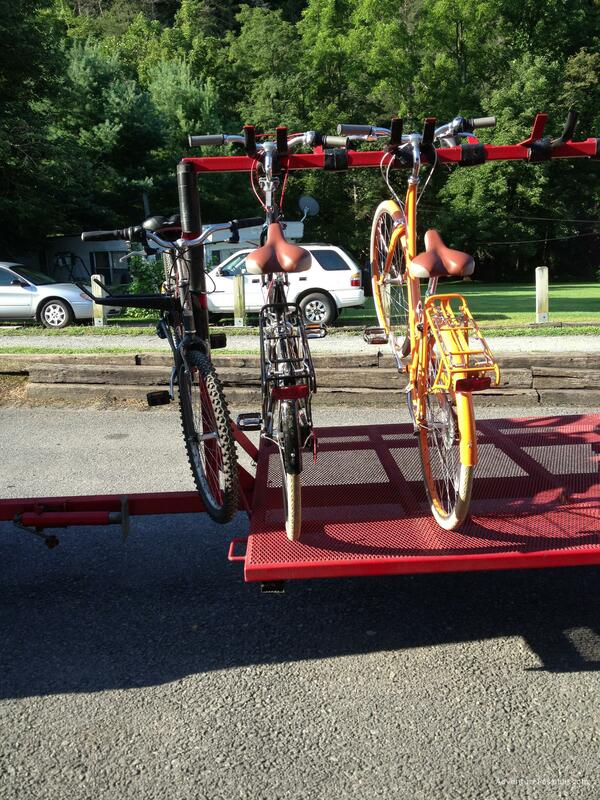 They rent bikes, gear, and baby seats / trailers for the Virginia Creeper. We loaded our bikes on the trailer, and took the 45 minute van ride to the top. Our 18 month old daughter bored quickly on the van ride, but we kept her entertained with picture on an iPhone. If you’re taking a baby, consider taking something along to entertain her. Our trip began atop White Top Mountain. It was a late August morning, but beware my wife was really cold even in the sunny morning. Temperatures were just below 50F to start the day. I dressed our daughter in multiple layers including a fleece jacket, which kept her warm in the cool shade of the trail. 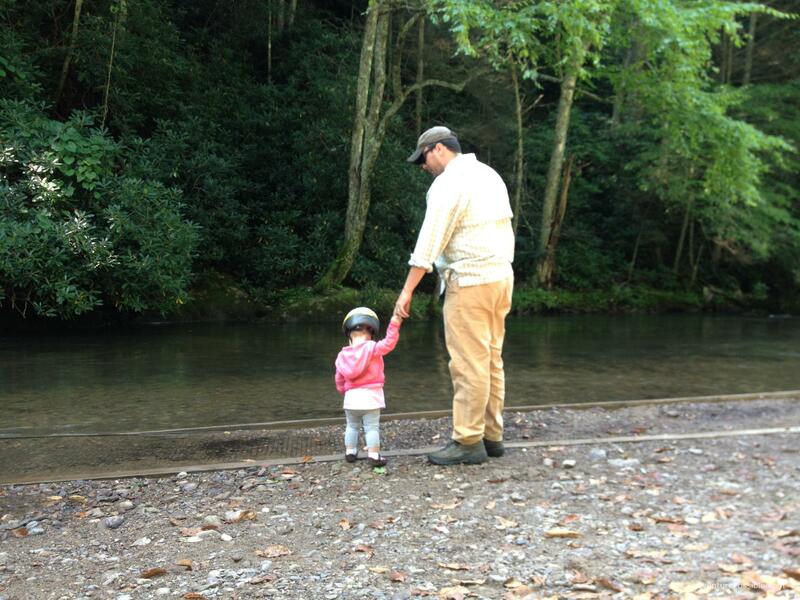 There are numerous opportunities to stop and explore along the Virginia Creeper. We stopped here at the old Buchanan shop for pictures and warmth in the sun. We rode and rode along the path, stopping here and there for a photo, a snack, and water. The first few miles are mostly coasting. Very little peddling with great views from high trestles. We discovered apple trees growing along the trail. We picked a small apple. They weren’t quite ripe, but we all took a small bite of this one grabbed by my daughter. As the trail descends the mountain, it runs along the Holston River. 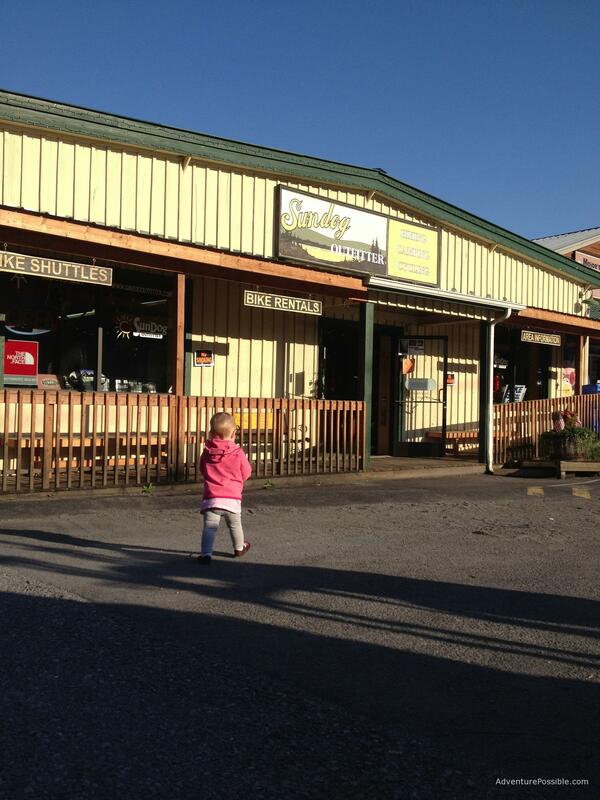 There are numerous opportunities to stop along the backs for the little ones to explore. The descent down to the river takes a little less than an hour. By that point, our daughter needed a chance to stretch her legs and rest her bottom. Our daughter handled the bike trip well. She began to tire near the end of the trip, but a snack and her water helped keep her attention in the last few miles. 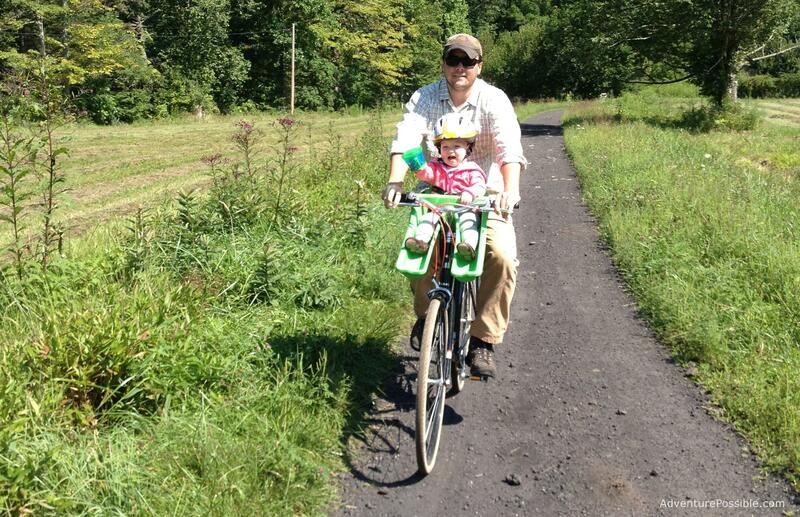 The Virginia Creeper was a great bike ride for a baby riding along. At a little more than two hours, it was just long enough for my wife and I to enjoy the long ride, and short enough that our daughter’s attention span could handle it. 1. Dress the baby warmly and in layers. An early morning start may mean cool temperatures, but the air will warm up as the day progresses and as the trail descends into the valley. 2. Be prepared to take short breaks every 20-30 minutes so that the baby can rest and stretch. 3. Beware that there are a number of rocks and potholes on the trail that will really jar your body when the bike strikes them. Be caution to ensure the baby doesn’t get jarred too badly by these bumps in the trail. 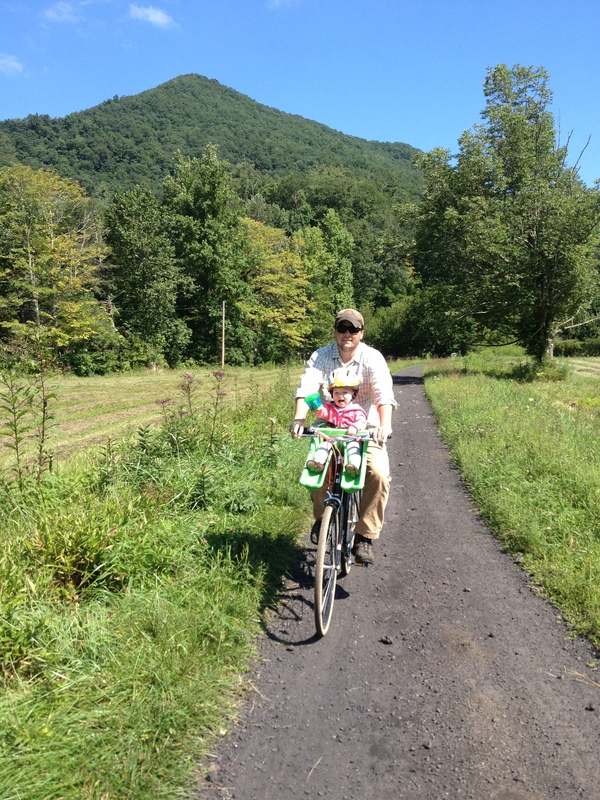 Happy Biking in the Virginia Creeper!